On New Year’s Day, I spent my time exercising, doing laundry, and whipping up a big ol’ pot of pasta fagioli! (pronounced “pasta fazool” by us Italian Americans.) Like a lot of other favorite Italian dishes, this one also started out as a peasant dish, being composed of inexpensive ingredients (i.e. pasta and beans). Families have since passed down their recipes from generation to generation, and each family has their own little twist on this tasty little soup. I remember eating this dish at my grandparent’s house when I was a kid, and this winter I had the sudden urge to recreate this in my own home. My grandmother passed the recipe down to my aunt who then in turn passed it down to myself. 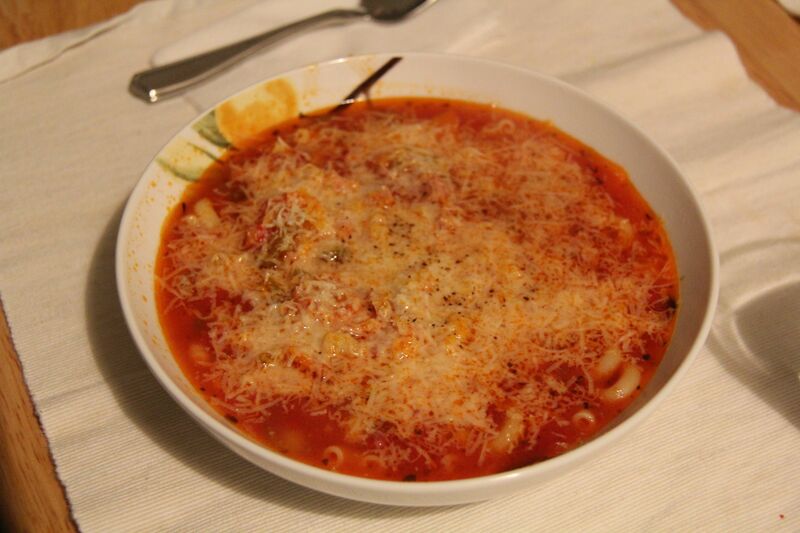 This was my first crack at making pasta fagioli, and according to my husband, it turned out wonderful! Of course, being me, I added a few of my own twists and turns to the recipe that I will share with you. Warning: I had to break out the lobster pot (my largest pot), and we ate this soup for an entire week (even after giving a large batch to my neighbors!) Be prepared, this produces more soup that you might think! Wash beans in a colander. Put beans in a pot and cover with water 2 inches above the beans. Boil for approximately 2 minutes. Let it cool and sit for one hour. 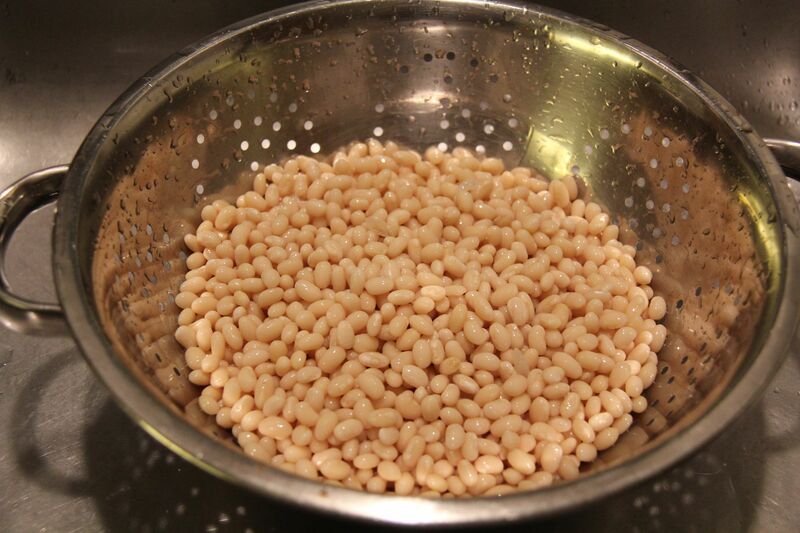 Return beans to colander and rinse well under cold water. Set aside. In a large pot, saute the garlic, onions, celery and carrots in the olive oil for 3-5 minutes until onions are iridescent. 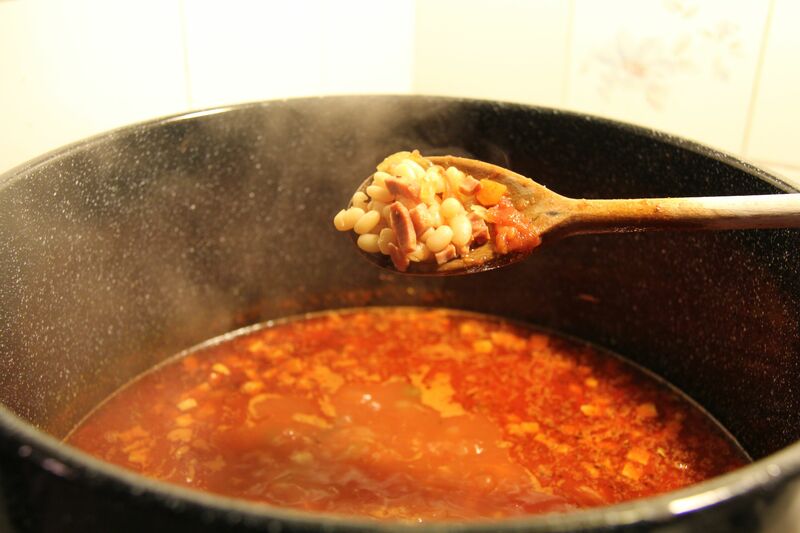 Add ham, beans, 1 can of tomatoes, salt, pepper, oregano, red pepper. Also add some white cooking wine, chicken stock, and water to taste. (You don’t have to use the full bottles at this time. I ended up using it all eventually as the soup cooked down, but I started with just enough liquid to cover all the ingredients. The original recipe just called for water to cover the ingredients, but I decided to kick up the flavor with the white cooking wine and chicken stock.) Cook until the beans are tender. This took me about 1 1/2 – 2 hours. Keep checking! As the liquid cooks down, add the second can of tomatoes (original recipe called for one can, but again, I wanted more tomato flavor), more cooking wine, chicken stock, and water to taste. 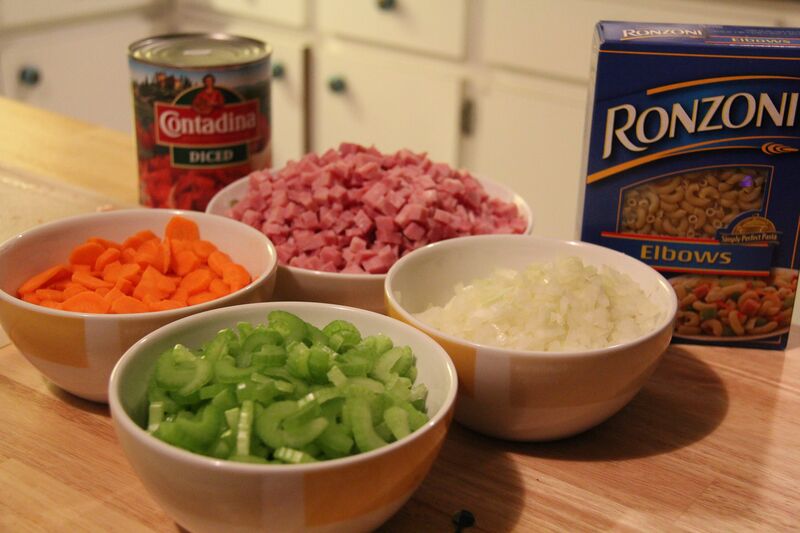 You can add as much or as little as you want depending on how thick vs. brothy you want the soup to be. The important thing is to make sure the beans are fully cooked. Cook the macaroni separate, then add as much of it to the soup as you want per portion. I ended up putting all of the cooked pasta right into the soup pot, but some people might want less pasta in their portion. Serve in bowls. Last but not least, top the dish off with some freshly grated Romano cheese! As you can see from my photos above, I like a lot of cheese. If you decide to serve up some pasta fagioli using my family recipe this winter, please let me know how it goes! I will be trying your recipe this weekend…….it looks wonderful:) This one will be added to my family recipe cookbook. 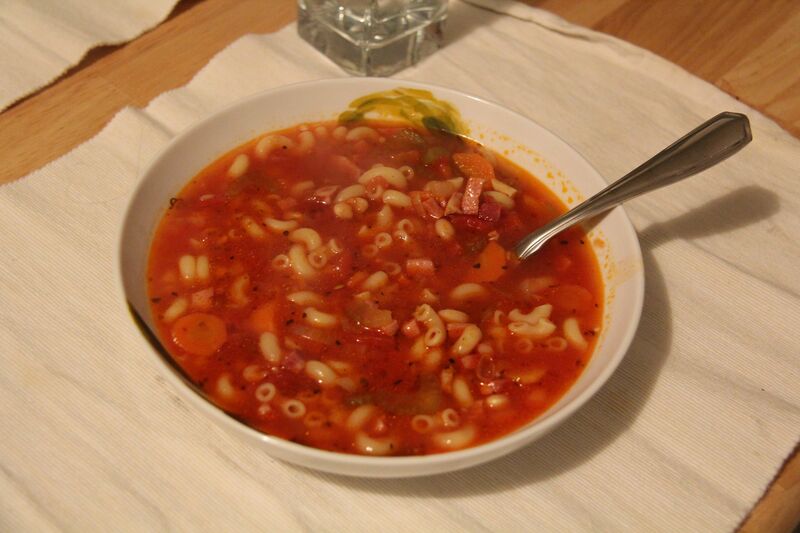 Favorite Italian soup ever. Love it. Love this recipe!